Currently viewing the tag: "steigerwald"
Curt Gentry, a San Francisco author who wrote or co-wrote 13 books including best-sellers “Helter Skelter” about the Charles Manson case and a harshly critical biography of FBI chief J. Edgar Hoover, died July 10 in a San Francisco hospital. Gentry was incredibly kind to me when I met him in the spring of 2010 while doing research for what became “Dogging Steinbeck.” He bought me lunch twice and gave me his notes and the draft of his Chronicle article (see below) from his encounter/interview with Steinbeck in the fall of 1960, when Steinbeck and wife Elaine stopped at the St. Francis Hotel on Steinbeck’s “Travels With Charley” trip. Gentry was one of the first to read my book and he wrote a wonderful blurb about it. When I read it at my book store/library appearances, I can hardly keep from choking up. He was a great guy with great stories. I’ll always be sorry he was too sick to meet with me the last time I was in San Francisco. 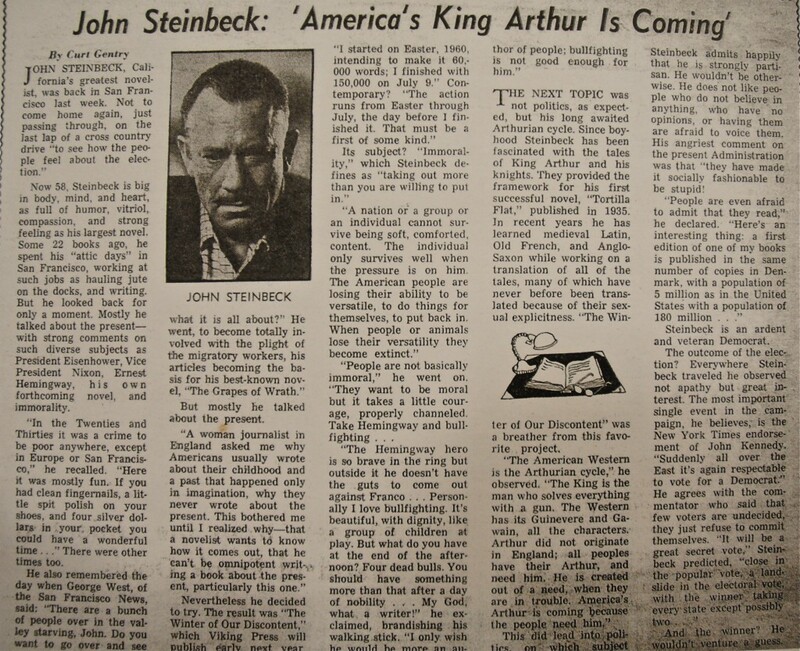 The article the late, great Curt Gentry wrote for the San Francisco Chronicle about his encounter with Steinbeck in 1960. I still believe John Steinbeck is one of America’s greatest writers and I still love “Travels With Charley,” be it fact or fiction or, as Bill Steigerwald doggedly proved, both. While I disagree with a number of Steigerwald’s conclusions, I don’t dispute his facts. He greatly broadened my understanding of Steinbeck the man and the author, particularly during his last years. 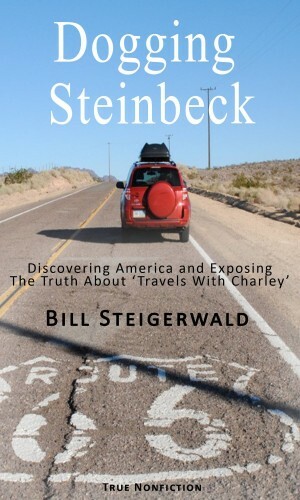 And, whether Steigerwald intended it or not, in tracking down the original draft of “Travels With Charley” he made a significant contribution to Steinbeck’s legacy. “Dogging Steinbeck” is a good honest book. In my never-ending quest to get a legacy publisher to publish “Dogging Steinbeck” so it can get into libraries and bookstores where it deserves to be, I left a phone message and sent a token pitch to the University of Nevada Press. The folks there were nice and responded, which itself was a rare treat. Thank you for telling us about your book Dogging Steinbeck. I regret that we cannot take on this project because it has already been published and is available on Amazon. I do agree that there will be new attention to Steinbeck this year, given the anniversary celebration of The Grapes of Wrath. You might find that the best use of your time is to try again to promote the book you have already released. It’s a pretty annoying and strange publishing system we non-famous, non-tenured authors are up against. I couldn’t get a book advance from a major New York publisher in 2010 — despite my fine proposal — because I was not famous, because road books don’t sell and/or because no one cared about Steinbeck anymore (these were the top reasons I was 0-35, despite my readable, crazy style, according to my Madison Avenue agent). I went ahead anyway, did my trip and wrote my book. On my own time, on my own dime. I got lucky, I met many memorable Americans along the Steinbeck Highway, I made real literary news by exposing the deceptions of a major American writer. And I forced a major publisher, Penguin Group, to confess that, after 50 years of masquerading as a work of nonfiction, “Travels With Charley” was really a bunch of fiction and dishonest BS. You’d think that in the declining world of publishing, all this would be worthy of a book. But after I took my road trip I still had no interest from legacy publishers. I did everything right and got really lucky, thanks to the Steinbeck scholars who were asleep at their desks for half a century. 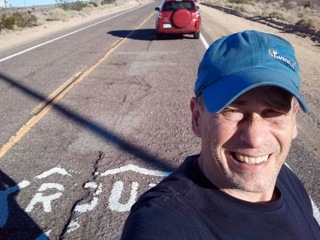 I wrote a road book that tells, in an entertaining and authoritative way, how I made major literary news, how I changed the way “Travels With Charley” will be read forevermore, and how I — by my self-promoting self — got media attention and editorial-page praise from the New York Times, got praise and plugs from the world’s most celebrated travel writer (Paul Theroux), got on NPR and CBC radio in Canada, got written up in the pages of the Washington Post and, best of all, got an hour of airtime with Brian Lamb on CSPAN. I also got grief, not praise or thanks, from the Steinbeck scholars. Then, when it turns out I was ahead of the curve on the 2014 Resurrection of John Steinbeck and my book is timely and topical, it still doesn’t matter. What earthly difference does it make to librarians and independent bookstore owners, and their clientele, whether my book already exists as an ebook somewhere? 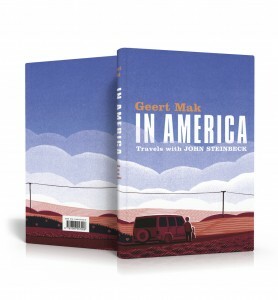 It doesn’t exist yet in print, in stores. How can a small publisher looking to sell 10,000 copies of a book with a long commercial tail that has already proved its value and credibility not want to take advantage of the work I’ve already done? It has nothing to do with an advance or royalty terms. It’s just a “rule.” I bet if my book started selling 100 ebooks a day a publisher would break the rule — I know it’s happened with other books. So far I’ve sold 1,000 copies without any help from a publisher or its marketing department. I’ve heard a dozen newspaper book editors say they don’t review self-published books. I’ve heard two dozen very short-sighted bookstore owners tell me they won’t carry my self-published book because they can’t return it. Other, even more clueless, bookstore owners have told me I can’t even appear in their stores to talk about my book and sell POD copies of it because I was hooked up with the Devil — Amazon. I know Amazon is the bad guy who’s mean to bookstores (most of whom are stuck in 1850 and can’t handle the competition). So I guess it makes the soon-to-be-gone bookstore owners feel good to do unto nobody authors like me what Amazon does unto them. Can you understand why I might not shed a single tear when I hear a bookstore had died? Amazon made it possible for me to get around the braindead publishing industry and get a book distributed around the world without costing me a quarter. Now Amazon is keeping me from getting a “real” publisher? I’ve proven in the marketplace and in the conflicting worlds of journalism and academia that my book “Dogging Steinbeck” is a valuable piece of literary and travel journalism. I caught Steinbeck and his publisher with their literary ethics down. I got praise from some of the smartest travel writers and journalists on the planet. And all I get — still — from publishers is the same Catch 22s. It’s no wonder the publishing industry is collapsing. It deserves to.